This is the first book to bring together an interdisciplinary, theoretically engaged and global perspective on the First World War through the lens of historical and cultural geography. Reflecting the centennial interest in the conflict, the　collection explores the relationships between warfare and space, and pays particular attention to how commemoration is connected to spatial elements of national identity, and processes of heritage and belonging. 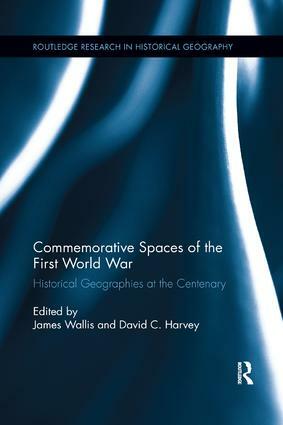 Venturing beyond military history and memory studies, contributors explore conceptual contributions of geography to analyse the First World War, as well as reflecting upon the imperative for an academic discussion on the War’s centenary. This book explores the War’s impact in more unexpected theatres, blurring the boundary between home and fighting fronts, investigating the experiences of the war amongst civilians and often overlooked combatants. It also critically examines the politics of hindsight in the post-war period, and offers an historical geographical account of how the First World War has been memorialised within ‘official’ spaces, in addition to those overlooked and often undervalued ‘alternative spaces’ of commemoration. This innovative and timely text will be key reading for students and scholars of the First World War, and more broadly in historical and cultural geography, social and cultural history, European history, Heritage Studies, military history and memory studies. How has it been defined, how has it been commemorated, how should it be remembered?